The Friedman Memorial Airport Authority expressed hope this week that two bills currently working their way through Congress could help keep the field’s air traffic control tower open despite federal budget cuts. The tower was listed as one of 149 federal-contract towers that the FAA will not fund after June 15 due to widespread federal budget cuts known as the “sequester.” The airport board decided at its meeting last week that it would fund the air traffic control tower for 30 days after the tower loses funding on June 15, with further funding to be discussed at a future meeting. Airport Manager Rick Baird stated at the airport board’s meeting that it would cost about $200,000 to keep the air traffic control tower running through the summer, money that would come from operating reserves. Baird cautioned that funding the tower from reserves would not be a viable long-term solution, however. Board spokeswoman Candice Pate said this week that the board is still pursuing litigation to keep the tower open, but that the authority is “pleased” to announce that Idaho’s congressional delegation is co-sponsoring legislation in both the House of Representatives and the Senate to keep air traffic control towers from closing across the nation. The bill goes on to say that if any air traffic control towers have been closed between March 1 and when the act is signed into law, the FAA must provide for resumption of the operation of the tower as soon as possible. The bill was originally sponsored by U.S. Sens. Jerry Moran, R-Kan., and Richard Blumenthal, D-Conn. 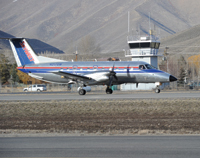 The FAA originally proposed closing towers as early as April 7, a date that was later pushed to May 5 for the tower in Hailey. The agency announced on April 5 that it would delay cutting funding until June 15, in order to allow administrators to sort out “multiple legal challenges” to the funding cuts. Of the 30 co-sponsors to the bill, two of them are Idaho Republican senators Jim Risch and Mike Crapo. Risch and Crapo join 17 Democrats and 12 other Republicans in co-sponsoring the bill, including Sen. Marco Rubio, R-Fla., and Sen. Al Franken, D-Minn.
Rep. Mike Simpson, R-Idaho, has co-sponsored similar legislation in the House. The Senate version of the Protect Our Skies Act was referred to the Senate Committee on Commerce, Science and Transportation last week. The House version, known as the Air Traffic Control Tower Funding Restoration Act, was introduced by Rep. Tom Cotton, R-Ark., on April 8 and has since been sent to the House Appropriations Committee. Pate said Sun Valley Co., Marketron, Fly Sun Valley Alliance, Atlantic Aviation, Sustain Blaine, the Wood River Economic Partnership, the Blaine County Pilots Association and other local businesses and organizations have been lobbying the congressional delegation to support air traffic control tower funding.